As more of our lives become digital, having a simple way to keep our devices charged poses a dilemma when out in the field, hiking, or during a power outage. Luckily, there are many solar options available and with each passing year, they get lighter in weight and lower in cost. Plus, as technology advances, the panels are producing more sun-juice then the portable systems that were available a mere three years ago. Why should preppers care about charging our digital gizmos? After all, if the grid is down, cell service will be INOP as well. The simple answer for me, at least, is that my devices are a virtual library of knowledge, crammed with eBooks, PDFs, photos, and a bit of entertainment to keep me occupied during dire times. With that preamble, I am please to introduce you to the Choetech 19W Solar Panel system. 4.3 What are the best oils for your survival kit? Here are my top picks. From the 10,000 foot level, the Choetech does exactly what it says it will do. Unfold the unit, expose the 3 panels to the sun, then plug up to two devices into the integrate USB ports. Whether you plug in a smart phone, eBook reader, tablet, or external battery pack, using the built in smart technology, the device will immediately begin to charge. No fiddling with cables, no figuring out which of the two USB slots to use (they are both the same), and no technical ability required. Coming down to the one foot level, the best part of all of this? I have one to giveaway to a lucky Backdoor Survival reader! More about that in a moment. In my usual style, I am not going to give you a 2 page laundry list of specifications. You can find those on Amazon. Instead, I will walk you through the key features. Size wise it is also compact, measuring 10.25″ by 6″ when folded up, pouch-like. The two USB ports put out the same amount of power. What this means is that both are rated the same so a tablet, for example, can be plugged into either port. There is no guessing involved. When the solar panels are facing an adequate amount of light, a red light in the charge controller with illuminate, letting you know that everything is working the way it is supposed to. Of course I confirmed this myself. If you have Apple devices, and especially an older iPad2 like mine, you know how persnickety they can be when charging. Even with the supplied adapter and cable from Apple, sometimes they refuse to charge. Over a period of days, I used the Choetech to charge my iPad and it worked 100% of the time. I wish I had kept better notes on the charging time but the one time I did keep track, my iPad went from 15% to 100% in about 3 hours. The Choetech comes with a single mini-USB charging cable. That worked fine but only fit my Kindle. I used my own cables for the iPad, iPhone, and EasyAcc power brick (which can be charged superfast using 2 cables so having two fast USB ports was a bonus). The cables, as well as smaller devices that are being charged, fit into a zippered mesh pouch on the rear of the panels, keeping things nice and tidy. I hope you are excited about this one because I am excited for you. As the technology advances, portable solar panels become more reliable and less expensive. In addition, the all important form factor improves. On all accounts, the Choetech 19W Solar Panel ranks right up there as one of my favorites. Getting some assistance from Tucker the Awesome Wonder Dog and his Kitty! I hope you will take a few minutes to enter the giveaway but if you want to get your hands on a unit sooner, between now and March 8th, Choetech is offering BDS readers a $6 discount on Amazon using code 4LIQ3GUN. Here is a link: Choetech Light Weight Portable Solar Charger. Bargain Bin: Below you will find links to the items related to today’s article plus a few other personal favorites. Choetech 19W Solar Panel: This lightweight and compact solar panel works great. The two integrated USB ports are both rated equally so you do not have to fiddle around to see which one will work with your device. For a limited period, Choetech is offering Backdoor Survival readers $6 off using code 4LIQ3GUN. The code is valid from March 3 to March 8. EasyAcc Monster 20000mAh Power Bank : This is a robust power bank that can be charged from your laptop, a wall charger, or a solar charger. This one is beefy, with 4 USB ports that can be used at once. It also appears to hold its charge for a long time. I charged mine up then set it aside for a couple of months, When I pulled it out of its box, it was still fully charged. A nice unit if you are interested in this sort of thing. 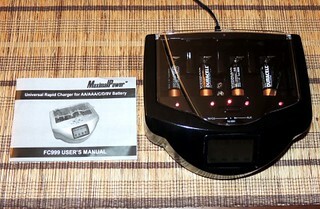 Maximal Power FC999 Universal Battery Charger: This nicely built charger will charge charge AA, AAA, C, D, N, 9V, Ni-MH, Ni-CD, and Alkaline batteries. It has an LED display so that when you first put a battery in the charging bay, you know whether it is viable for charging or simply bad and ready to go back to the recycle box. Yes it really works, even under solar power. Read about in this article: How to Recharge Alkaline Batteries. Lights Out: A Cyberattack, A Nation Unprepared, Surviving the Aftermath: Think you don’t need to worry about a long-term grid down situations. This hallmark book, by award winning journalist Ted Koppel, will hopefully educate the sheeple and motivate them to embrace the message of preparedness. For the rest of us, there is much to learn about the state of preparedness, or lack thereof, at the highest levels of our government. Read more: Prepper Book Festival 10: Lights Out by Ted Koppel. 100 BIC-style Lighters Disposable Classic Lighter: In addition to power, you are going to need fire. Running about 16 cents each and free shipping, these are great to have on hand for both survival and barter use. 10 Pack Mini LED Flashlights : What a great deal on 10 mini flashlights on a key ring – button batteries included. I happen to like a more sturdy ring so I remove the one that comes with and use a small bit of tie-wrap (zip tie) instead. The included battery seemingly lasts forever and at this price, you can stash them in the car, purse, pocket, tool box and by the circuit breaker box, and still have some left over for other uses. As of this writing, all 10 are under $4.00 in black, although from time to time they are available at that price in colors. Shipping is free. I prefer paper because it’s a break from technology. I prefer Kindle as the digital device. I prefer paper but have both a Kindle and Nook for those times when I can’t take print books with me. It is a bit expensive as are many Sure Fire products, but it is a Sure Fire after all. Got my first SF light in Iraq (E2E Executive). Liked it so much, I bought similar ones for wife and kids. I also prefer to read paper but have similar documents/records/entertainment/photo files on my phone (Samsung), so keeping it charged and having those documents available is a big deal. Anyway, looks like a neat device. Hope I end up with it. I prefer paper (maybe it’s my age) but I do keep a digital library on my IPad. I really prefer paper for reading novels for enjoyment, and for cookbooks. However, I use an iPad daily for catching up on news, research, staying in touch. I bookmark lots of articles for easy refernce later. We also just got a Fire, but I haven’t mastered it yet. I would love this solar charger! I’m old school and prefer paper to digital. – easier to hold, tends to be flexible. When I do use an electronic device it’s an iPad, versatile and reliable. I prefer paper. Nothing beats holding a book. If I have to use a device I use a kindle. Books are a tactile and a visual experience and I love the book smell but with severe carpel tunnel in both hands holding a book is a painful experience. Also with an electronic reader I can enlarge the type to help with my poor vision. I have a firm office chair and a 23 in monitor, with a one finger click I can turn pages and with hundreds of free e-books from Amazon I read for cheap. I prefer paper but with digital you can carry more. I use a Kindle App for the iPad. Paper and books, by far. I use my laptop for pdfs and kindle. Cant have too many chargers for our devices. Just spent 4 days in the back country with no service of any kind. Was rather nice, but was sure enjoyed having my kindle to have to read some books. I like the iPad for social media but when I want to read a book I prefer paper. I use Kindle but love the feel of books in my hand. What a cool tool to use to stay connected in the wilderness. Great offer! Very important tool for survivalists and prppers. I don’t care, as long as I have reading material! It could be on papyrus if that is all that was available! I have a nook that I have the nook and Kindle app downloaded to. I prefer digital just for the fact of being able to store many more books on my kindle and that ebooks are cheaper than regular books. I prefer paper, but I’m learning to like digital. My preferred digital reader is the Kindle app on my phone. There are some things I want/need to have a hard copy of, but for the hundreds of books and reference material I’ve downloaded my tablet is the way to go. These sounds like a light weight, simple to use layer of protection! If I’m actually reading, I prefer a physical book. However, I’ve been reading “audio books” for years now and really prefer it. I prefer paper. I love holding a book & love highlighting and writing notes right on the pages. I also have a kindle filled with valuable material for away from home and quick access. I think most of us have a foot in both worlds! Kindle for pleasure reading, physical book for cookbooks and reference books so I can look ahead, go back, skim through, etc. Paper- I don’t have a digital reader. I would like to get one someday for recipes. I prefer paper. There is nothing like the smell or “cracking” open a new book to read. I don’t have a Kindle or I-Pad but have used one of my friend’s Kindle. I really don’t like it, DH has a lap top that we use right now. Both of us due to knee surgeries can’t get to the desk top in the basement office just yet. Guess I will have to join the 21st century at some time but I really do prefer having the paper. this would be awesome to win so I can keep the laptop running for DH. It depends on when! Many times I prefer printed. The printed pages do not require any power except manual power. But, there are other times when I like the digital format. For one thing, you can store much more info on digital than you can on paper. That is in the same size or weight. Preferred digital device? Kindle apps! I usually try to get digital books without DRM, but sometimes a particular book is only available with DRM protection. With non protected books I can convert to PDF format and print them if I want to. I’ve got two smaller portable solar chargers and I really like them. Having a larger capacity solar charger, that is still light weight and portable would be great. We would need a bunch of these for all of the tablets, and phones, in our family. I prefer digital over paper, but keep paper copies of my most important resource books. Paper is harder to destroy than digital, but digital is much more portable and with a solar charger like the one in this article it’s easily maintained for months to years if its not abused. I’m definitely a big fan of the Kindle and while it’s my favorite, I also use an iPad and iPhone both for reading Kindle books and for other web activities. But in a bug out situation, the iPad is being left behind and the Kindle is being put in the backpack. I’ve been needing something like this for some time. Previous ones that I’ve seen either had to much with them or had to many bad reviews. Thanks! Digital. I love my Kindle Paperwhite. I use my tablet with Amazon kindle app. I love all the free books that you find for us ???????? I love all the great information that you share with us. I also try to have hard copies of important information to have in bug out bags and in our vehicles. And of course in our bug out locations. Thank you for all that you do???? I prefer paper for “keepers”. Non-fiction for the most part. History, Bios, reference, etc. Also prefer paper for “classic” fiction. Basically, if it’s something that I likely will read or refer to again, then I’d rather have a hard copy. E Readers are great for “entertainment” reading, due to the simple fact that the volume of reading material that you can house in such a small space is wonderful. I have an old Kindle “keyboard” that I generally use for most of my reading right now. It has actual buttons to push to turn the page instead of “swiping” so is less likely to accidentally turn pages. It has been acting hinky and has a couple of cracks in the casing and so probably is not long for this world. So its the one that I carry with me, if it gets stolen, lost or broken, not such a great loss. I bought a Kindle Fire HDX as a replacement, but found that I really don’t care for it as a reader. I LOVE it as a tablet, but I prefer a dedicated reader and so recently bought a Kindle paperwhite. Truth be told, I prefer the old Kindle, but its not going to last forever and they are no longer available. I prefer paper for most reading especially complex material as it also serves as a good reference. I use a kindle for some light reading material but call me old school, I still prefer paper. I have lots of paperbacks for the family. I pick up DIY and other prepping books when I find them on sale. I am storing tons of free DIY, recipe and preparedness books on my kindle. Having a way to keep the kindle charged when we lose electricity is critical. Love the blog and am always sending articles to my hubby. Always looking for a power source other than more batteries. I prefer paper for cookbooks and magazines but love my kindle for novels. Most of my preparedness and homesteading books are paper. I have Countryside Journal from 1998. When it comes to books I prefer paperback. I have read several books on the computer, but I find my recliner and a paper book is so much more comfortable, that I can’t give up my books nor can I get past my love for paper. I prefer paper but I have a Kindle for reference books. Anything that is important enough to read, you should have a hard copy. If I do read digitally, I use my PC. Anything that is important enough to read, you should have a hard copy, so paper. If I do read digitally, I use my PC. Thanks for the review, looks like a nice pack. I have moved most of my books to digital format with thumb drive backup. I am totally old school – I prefer hard copy. I love books. Besides if stuff gets bad enough we may not have Internet and good old books will be priceless. Having said that – my whole family is totally digital. Kindle seems to be their preference. If the book is a good reference book and available in paper, I try to get it on my shelf. That also goes for fiction that I plan to reread. For other books, especially the “freebies” that Gayle finds on her Facebook page, I put those on my Android tablet. Since I like using real books so much better, I sometimes “forget” about the ones on my tablet 🙁 Old habits die hard. I’ve had my tablet for about 18 months and am still trying to get used to it. I usually lean toward digital because of the ease of carrying a large number of resources, which is difficult to do with paper and nor get weighed down. I do have a few paper book resources in by kit though just in case. I primarily use my phone or laptop. My preference is both. Depends on the situation. Books are good because I highlight and make margin notes. My kindle reader is good because there can be a lot of books on it and is easily carried. Libraries are hard to carry in a pack. I love my paper books but I am trying to downsize so I am moving more to digital. I have two Kindles, with the newer one being a Fire HD and that’s fancy enough for me. I have a backup ereader that’s very easy on the eyes (non-Kindle) that’s lightweight for daily travel. I like both! I can carry more digital but I like the fact that I don’t need electricity for paper. When I find a decent reference book, I try to get both paper and digital. I love my Kindle for reading fiction and history, but I also like the feeling of security in having my prepper and reference books on paper. I definitely prefer paper, it’s probably because I’m an old fart! The only thing I have that I can read digital on is my laptop. I have looked at various digital readers but it looks like in addition to the cost of the unit and the cost of the book there’s also a fee or extra cost for 3G connection to the internet and/or the unit only works on wi-fi and we don’t have Wi-Fi set up in the house and 3G connectivity is questionable here as well. For around $25 you can get a wireless router. You could then use a reader or your smartphone without using 3G. I’m a techy old fart but with online help anyone can set one up. If you are using the internet without a router you are exposing yourself to online crooks. I prefer paper because you can read it anywhere anytime and don’t have worry about having a charge or a place to recharge. For digital, I have an iPad and Nook. This looks like a great solar charger at 19 watts so it will be great for my Kindle, Samsung S6 etc., but I also still like paper. There is always something that needs charging. Portable devices and a portable solar panel go together. – I prefer Kindle for reading. It’s just so handy and easy to carry. However, when there are graphs or diagrams involved (technical stuff) my preference is paper. – I have the Goal Zero Nomad 7 solar charger. I’m surprised at how full-sun vs. partial sun affects the output. Full-sun isn’t just noticeably better, it’s like partial sun barely works. That is something which reviews like this should check. Paper! If the power goes out or batteries die it still can be red. That’s a hard one as I have some many books and magazines in both formats. I’ll go with paper because it’s always with you. Digital for pleasure reading and paper for the things I want to study. I have a Kindle. I prefer paper, but my daughters gave me a Kindle for Christmas. Have only had it 2 months, but I find I use it more than I thought I would. So my preference may change. I prefer paper. Simple, reliable and doesn’t rely on the grid. When I go digital I use a mid range priced android tablet. Lightweight and much easier to carry a “large” library. I like paper and have too many books! My kids have been doing everything possible to get me into the digital age. I’m trying… This portable solar panel looks like an answer. I prefer paper books, but I received a Nook for mother’s day that I use as well. I’m old-school, I like good book. I’ve only dabbled with reading on a HP Slate tablet. I prefer paper over digital, however, I have a Kindle and a kindle Fire. I like paper the best b am trying to learn and become more familiar with digital. Family members assure me I will like the digital the most after I use it consistently. I have both paper and digital. Prefer to use PDF documents, so they can be read on different devices. Plan to store the digital documents on hard drives and USB flash drives. I have a Kindle Paperwhite that I love. Still own some books and have printed out some items to keep. Both ways will work but I do need a solar charger and it is on my list of next to purchase. I’ve been in the market for one of these for some time now. It would be wonderful to win one. I prefer paper, but my digital choice is a kindle. I really prefer “paper” but I do own a Kindle. I bought the Kindle because I was running short on bookshelf space. I prefer paper…but digital mediums have their uses. I like the Kindle. I use both but prefer paper. Kindle hold more and is light weight but I still love my books! My current favorite is digital, although I still have a huge library of paper books. I have a Nook and an iPad with both the Nook and Kindle apps but use the iPad the most. I prefer paper but also like digital since I can carry it with me and not have a bunch of books or papers to shuffle or worry about weight. I have an iPad mini and actually like it quite a lot. I never thought I would make the switch to digital but it is so convenient…usually. I can’t read it in the bright sunlight so for my keepers I prefer paper. wow. fun give-away. this would be great to use on mission trips or road trips — can charge my back up battery or device as we go and recharge items as needed in stead of outlet scouting everywhere. Kept paper material for so long – everything from old notes to knowledge ABOUT US history, physics and more. But recognizing that simply storing stuff can lead to more and more stuff, well, I have to let some of that go. Cant hold on to everything. So I’m convinced keeping paper essentials file for the go bag for emergencies and quick reference, but having a portable digital plus solar charger – multi-purpose device such as a phone where I can read pdfs and other notes – greatly expands knowledge on the go. I prefer paper for my prepper material, but electronic is great for other reading. My favorite device is my iPad (I can put all my Kindle material on there, too). Normally I would prefer paper because in my opinion nothing will ever take the place of holding a book in your hand. But lately, I’ve been switching back and forth from paper to digital. It really depends on the mood I’m in. I prefer kindle as my digital device. I prefer paper. I do however have stuff on my laptop as well. I prefer paper (books,newspapers and magazines), but I do have and use a kindle. I have been looking into chargers and this looks like a good one. I prefer paper because of the feel of the book and the smell of the pages. When I use an electronic device for reading, I use my iPhone.